PRC recognizes the top performing schools (colleges and universities) in the March 2018 LET exams. Shown below is the complete list of schools' performance and top performing schools for March 2018 Licensure Exam for Teachers (LET), both for elementary and secondary levels, as well as the top performing schools with 50 or more examinees passed and with at least 80% overall passing percentage; as per Commission Resolution No. 2010-547 series of 2010, courtesy of PRC. 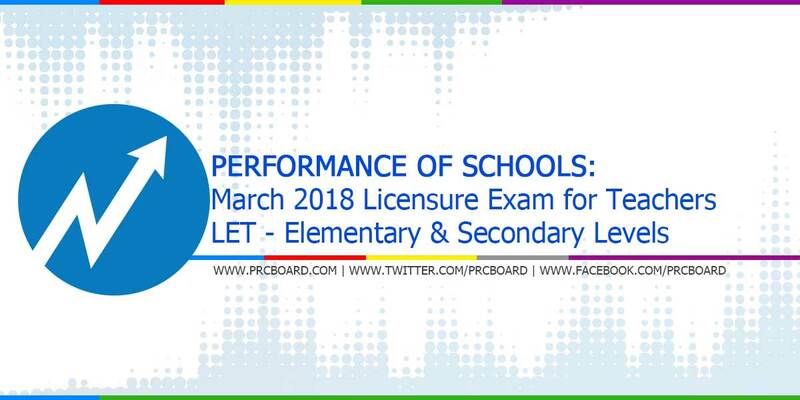 You might also want to have a quick overview of the schools' performance during the previous licensure examinations for Teachers in the last three (3) exams. The tabular presentation of the results showing the name of the college(s) or university(s) in the top spot, the total number of board exam takers, number examinees that hurdled the exams and the overall passing rate are shown right after. Meanwhile, to keep updated on the official March 2018 LET result, you may also follow us at our social media accounts via Facebook and Twitter. Good day! When will be the release of performance by schools rating? Hi! I'm one of those passers of LET last march. I read about your post that we can now verify our rating online, but I'm having trouble setting the date of examination because no choices appear when you click the botton. I don't know why, but I just can't set the date. Is it just me, or is there a problem with the server? I do hope that you can help us with this. thank you and more power.